Raquel is not a marine biologist, but she can tell right away that the whale washed up on Bellhaven Beach is dying. It’s late winter and the wind gusts, cutting through her coat as she walks along the shore. She doesn’t notice the whale until she’s almost on top of it, which seems impossible. It looms on the sand, gray body barnacled, sheen of dried salt on its head. Each time it takes a labored breath its body swells then recedes, much like the tide bulging back to sea. She steps closer, one hand reaching toward the animal, the other covering her abdomen, an instinct that surprises her. Her fingers are inches from the whale when it huffs suddenly, water running weakly down its jaw. She gasps, trips, thuds into the sand. The whale doesn’t even blink. A crowd gathers on the shoreline, TV crews and gaping bystanders, a few scientists, the police and the Coast Guard. Near the edge of the horde, an older man wearing a heavy work coat speaks to some onlookers. Raquel joins their orbit, hugging herself to stay warm. It’s mid-morning but colder than it had been at dawn, as if each inch the sun rises causes the temperature to drop, a ruthless trade. “If you look closely, you can see that the left side of the whale is bruised,” the man says. Raquel looks; the bruises resemble continents, darkening large swathes of the whale’s body like a map. “Most likely a ship crashed into the whale while they were both minding their own business, and by the look of things the whale lost.” The crowd murmurs and she imagines the animal swimming in the dark ocean, the sudden impact, its pain and confusion. How awful, that in an ocean this big there isn’t room for them both. Either that or the whale has terrible luck. Raquel can relate. “Why didn’t the whale get out of the way?” someone asks. The crowd begins to drift away, driven by the wind and cold. Raquel stays until only she and the man are left. He’s older than her, as old as her father, probably. But he seems intelligent and capable, handsome in a very specific way. “Are you a scientist?” she asks. “Five months,” she says. She hasn’t even been to the doctor yet, keeps hoping she’ll wake up empty. “Congratulations. A new life is a beautiful thing.” He takes her hand and rubs her palm gently. Any other day she’d pull her hand away, bemoan the entitlement of men who think they deserve access to every inch of a woman. Today, however, is different. There is a whale dying on the beach and a baby swimming inside her. Today, she lets him hold her hand and her heart flutters. They could wait until night, she reasons, then sneak behind the dunes where the whale can’t see them. The man could remove their coats and cover her body with his to keep them warm. He’d be grateful to have her, and she’d owe him everything. This is the kind of love she needs, now more than ever. She’s about to ask him to follow her to the dunes—she’s about to ask him for everything—but before she can form the words something at sea catches his eye. He lets go of her hand and squints at the shoreline. The whales continue to arrive over the next few days. It seems each time a wave breaks on the shore, a bruised body rides its crest. It soon becomes clear that the man—his name, Raquel learns, is Jacob—was only half right. The whales have been struck by something in the middle of the sea, but they haven’t been separated from their families. Their families are here, dying right beside them. The phenomenon dominates the local news, then the national news. Soon reporters in a dozen languages line their sad excuse for a boardwalk, interviewing the locals about what they’ve seen, heard, felt. Raquel refuses to talk to them. In the beginning she still goes to work, rushing to the beach as soon as the clock strikes five. But no one in her office cares about the whales. At her desk, she deletes emails without reading them, leaves her phone off the hook, imagines what the first whale felt when it was struck by the ship. Surprise, maybe betrayal, definitely denial. Probably the whale kept swimming after the impact, limping along in the current, pretending everything was fine until the pain grew too large to ignore. The baby kicks for the first time, sharp and insistent against her ribs. Jacob tells Raquel that the whales are finbacks, known as the greyhounds of the sea because they are sleek and fast. She has to take his word for it. Here on the beach their bodies are bloated and immobile, and the stench of death hangs thick in the air. There are so many carcasses on the shore and in the shallows that it’s difficult to get to the live ones. Others float, dead or half-alive, obstructing the course to sea. Marine biologists show up in black wetsuits, euthanizing the ones that still hang on. It’s gruesome, and she can’t stop watching. Jacob is still watching, too. As it turns out he is a janitor at the laboratory, works nights emptying trash cans and cleaning windows. They arrive each morning at the same time, after his shift ends and when her day at the office should be starting. By the third week he starts bringing her a Styrofoam cup of coffee from his favorite gas station—“Decaf,” he says, “for the baby.” She thanks him and never admits that she’s already downed an espresso on her way to the beach. All the while, the baby grows. Each morning she wakes to a different body from the one she went to bed with, her shape shifting as she sleeps. The changes that aren’t immediately visible are the strangest—her organs pushed to one side, her veins heavy with new blood. She skips the holidays with her family, who moved upstate a few years earlier, leaving her alone on the Island. They don’t know about the pregnancy and she isn’t ready to tell them. Instead she rings in the New Year alone, unless you count the whales. Which she does. Eventually spring arrives. One morning Jacob is waiting for her at the edge of the water, empty-handed. She approaches him belly first, her coat straining against her stomach. “More or less.” And then Jacob shares a detail she’s somehow missed, or maybe just ignored. 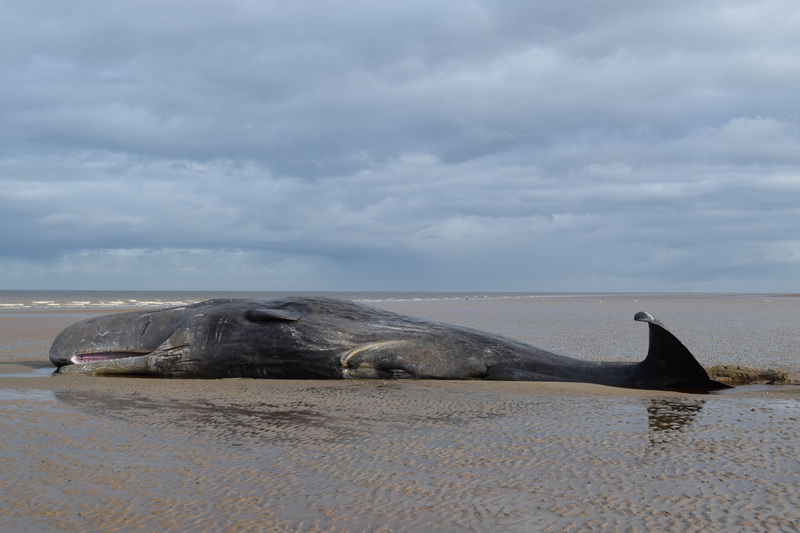 A beached whale’s death is not glamorous. Gas builds up inside their bodies as they begin to decompose, but it can’t escape. As the days grow warmer, the problem of this trapped gas becomes more dangerous. They could explode at any moment. The first few whales, the smaller ones, had been hauled off when they started to rot. But now it’s harder to get to them—when they drag the dead ones away, their bodies knock against those still languishing in the surf. The skin rips, pouring decay into the wake, the stench of death into the air. Summer is coming, and with it families and tourists who did not travel all this way to visit a graveyard that could combust at any moment. Better to do it now, while it’s still quiet. As Jacob explains all this, Raquel takes a deep breath and nearly gags. “That’s not right,” she says. “That’s life.” Jacob turns his face toward the ocean. His profile is jagged, an unkempt beard blurring the lines of his face, his nose a sharp hook that turns on itself. She still thinks he is handsome, still dreams, occasionally, about his hands on her breasts, especially during these final weeks of pregnancy. All her dreams have become more vivid and she often wakes in the early morning hours with an ache between her legs. But something changes in that moment. Further down the beach, the marine biologists drag bundles of dynamite toward the biggest whale, shoving them into its body while Jacob watches, resigned. It is the resignation that transforms her crush into pity, and then into sorrow. Every man in her life is the same—they give up too easily, are sustained by too little. All her life she’s followed them blindly, hoping they’ll lead her somewhere new, but each time she is left marooned, trapped beneath the weight of her mistakes. Jacob doesn’t notice when she slips out of her shoes and steps into the water. It’s cold against her skin, shockingly so, but she does not gasp when the waves reach her ankles or splash against her thighs. She doesn’t gasp, either, when she feels the first contraction rip through her body. No one would have noticed if she did, because the bomb is detonated at the same time. Bystanders scream as chunks of flesh and blubber spray across the sky, a macabre fireworks display. She takes another step forward, feels another wave of pain pass through her. She doubles over, her face nearly touching the water, and says a prayer. When she raises her head she can see clear across the ocean, as if she is peering through a pair of binoculars. In the far distance, just below the horizon, a dark shape approaches. It’s a whale, sleek and fast, powerful and alive, swimming toward the shore. No matter how long it takes to arrive, Raquel will wait. Christine Hennessey earned her MFA from the University of North Carolina Wilmington, and currently works as the content and social media specialist at a tech company. Her writing has appeared in Joyland, Flyway, Necessary Fiction, The Boiler, Bodega, Heavy Feather Review, storySouth, and LIT, among others, and she has received fellowships to Aspen Summer Words and the Vermont Studio Center. She is currently at work on a novel about a one-hit wonder and a short story collection about Long Island. Read more at www.christinehennessey.com, or tweet her at @TheNewChrissy.